Football is a 365 day a year game. A day by day reminder of some of the famous, record-breaking or bizarre things that have happened in the month of September over the years. After Everton had left Anfield for Goodison Park because of a rent increase a new club needed to be found to play at Anfield. That newly formed club – Liverpool FC – played its first-ever match on this day in 1892, beating Midland League champions Rotherham Town 7-1 in a friendly at Anfield. Around 100 turned up for that match but when Liverpool played its first competitive match – just two days later against Higher Walton in the Lancashire League – the Anfield crowd had swelled to around 200 to witness an 8-0 victory. From small beginnings…. Tottenham Hotspur played their first match in the Football League, beating FA Cup holders Wolves 3-0 in front of 20,000 at White Hart Lane with Vivian Woodward scoring their first League goal. David Beckham made his England debut in Glenn Hoddle’s first match as England manager as England defeat Moldova 3-0 in a World Cup qualifier in Chişinău. Yes, it really happened. Michael Owen scored a hat-trick as England beat Germany 5-1 in a World Cup qualifier in Munich. Really – it happened! The day after Liverpool had played their first match at Anfield it was the turn of Everton to play their first match at Goodison Park. Bolton Wanderers were beaten 4-2 in a friendly. The first League game at Goodison was played the following day, Everton drawing 2-2 with Nottingham Forest. The Football League became a national competition. On Saturday September 2nd 1893 London - and in fact the south of England - witnessed its first match in the Football League. In front of 10,000 fans at the Manor Ground in Plumstead Woolwich Arsenal drew 2-2 in a Second Division match against Newcastle United. It was also Newcastle's first match in the Football League. Link - 1893/94 Division 2 table and results. Bob Blanthorne’s debut for Newcastle United against Bradford City lasted just ten minutes before he broke his leg. That proved to be the only time he played in the first team in his two and a half years at the club. The record books show that Bournemouth's record League victory was a very impressive 8-0 away victory at Birmingham City in the Championship on 25th October 2014. 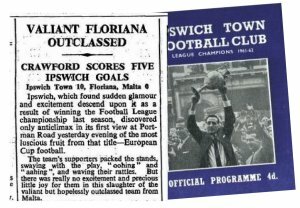 However on Saturday September 2nd 1939 they did beat Northampton Town 10-0 in a Football League Third Division (South) fixture. But the next day war was declared on Germany and the few League matches that had been played in 1939/40 were declared void and expunged from the record books. Various reasons were offered for Northampton's heavy defeat. Unusually alcohol had been permitted on the rail journey, that 'ringers' had been fielded and simply that the Cobblers had not bothered because war was inevitable. After First Division Southampton defeated Second Division Watford 4-0 in the League Cup Second Round first leg match at the Dell back in the 1980/81 season few gave the Hornets any chance of progressing in the competition. But on September 2nd 1980 those present at Vicarage Road witnessed one of the great come-backs in the competition. Graham Taylor's Watford led 2-0 at half time and were 5-1 up at 90 minutes to force extra time - even the one Southampton goal was a Watford og! Two more Watford goals followed and Watford won 7-1 on the night and 7-5 on aggregate. Amazing. A bizarre abandonment at Chester's Sealand Road in 1981. A League Cup First Round First Leg tie between Chester and Plymouth Argyle came to a halt when Chester 'keeper Grenville Millington collided with an upright when making a save, breaking the post and presumably not doing his own health much good either. It couldn't be fixed so the match was abandoned after 78 minutes and Plymouth were forced into another long round-trip to replay the tie a week later. Wolves were renown goalscorers in the 1950s but nobody expected the headlines they made when visiting Cardiff City in a First Division match on 3rd September 1955. 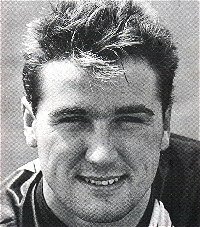 Johnny Hancocks scored for Wolves in just 30 seconds and he went on to score a hat-trick as did Roy Swinbourne. Further goals from Peter Broadbent (2) and Jimmy Mullen gave Wolves a 9-1 victory at Ninian Park before 40,060 fans to equal the record for a top flight away win, a record that still stands to this day. Amazingly when Cardiff visited Molineux for the return fixture on December 31st the Welshmen won 2-0 - that was the first home defeat suffered by Wolves that season and at the time of that loss against Cardiff their 9-1 win in Cardiff was the only time Wolves had won away that season. After Arsenal had played just one Premier League match at the Emirates Brazil played their first ‘home’ match at the ground, beating Argentina 3-0. In future years Brazil regularly played in their adopted home in North London. England had a dismal time at the 2014 World Cup finals in Brazil and when they played their first match after the finals - a friendly against Norway at Wembley - the fans showed their displeasure when just 40,181 turned up. That was a new low for an England crowd at the revamped stadium - but things were as bad on television. ITV showed the game live and it was up against the Great British Bake Off on BBC. Nearly twice as many people watched the Bake Off! The newly-appointed England captain Wayne Rooney scored the only goal from the penalty spot. At a meeting at the Adelphi Hotel in Sheffield members of the Wednesday Cricket Club formed a football club to keep fit during the winter clubs. That club is now Sheffield Wednesday. Chelsea played their first match at Stamford Bridge on this day in 1905. Chelsea's early history was a bit unusual. They were elected to the Football League without having kicked a football in anger and didn't play at match of any kind at home until after they had made their debut in the Football League. Their League debut was a 1-0 defeat at Stockport County on September 2nd 1905 and two days later Chelsea played their first match at Stamford Bridge, a 4-0 victory in a friendly against Liverpool. Almost exactly a century later the same two clubs were playing at the same venue in a Champions League semi-final watched live by millions worldwide on something called a television - who would have guessed that in 1905! The attendance at Craven Cottage for Second Division fixture between Fulham and Bristol Rovers was 21,127 which was well over double the number that were at their previous home League match. The reason - it was the debut of one George Best in the Fulham side. Also in the Fulham side that day were Bobby Moore and Rodney Marsh but it was Best who stole the show scoring the only goal of the match after just 71 seconds. The curious incident of Walter Pontin and the the deflated football. Chesterfield beat Burnley 4-1 in a Second Division match at Saltergate – but it really should have been 5-1. A shot from Chesterfield’s Walter Pontin had beaten the opposition goalkeeper and was about to enter the net when it burst and failed to cross the line (newspaper report below). Such is life! Gillingham made the sort of start to the new season all fans hope for - unbeaten after the first four Division 3 matches without a goal being conceded. Then they visited the Priestfield Stadium for their fifth League match against Gillingham......and lost 10-0. Amazingly in their previous home match Gillingham had beaten Southend 8-1 and in their programme notes for the Chesterfield match they had said ' you begin to wonder if the club has exhausted its quota of thrills for the season' - seemingly not! After a 503 day exile Coventry City finally returned to their home ground, the Ricoh Arena. A row with their landlords had seen them move home to Northampton Town's Sixfields ground but a 68-mile round trip had seen their attendances nose-dive. The 27,306 Friday night crowd for their homecoming against Gillingham was more than ten sides the average for their League matches at Sixfields. Coventry beat Gillingham 1-0 in their first match at the Ricoh since 20th April 2013. Following their move from the Manor Ground in Plumstead, Arsenal – still Woolwich Arsenal at the time - played their first match at Highbury against Leicester Fosse in the Second Division. A 20,000 crowd saw Leicester’s Tommy Benfield score the first Highbury goal, George Jobey equalising for Arsenal with Arichibald Devine scoring the Arsenal winner from the penalty spot. The day that Terry Butcher became a blood donor in the England cause. England needed a good result against closest group rivals Sweden in Stockholm to keep on course to qualify for the 1990 World Cup finals in Italy. Central defender Terry Butcher suffered a deep gash on his forehead early in the game which was stitched and bandaged up. But the Rangers defender continued to head the ball which opened up the wound and left him seriously blooded as shown in that iconic picture. But helped by his heroics England drew 0-0 - they didn't concede a goal in any if their six qualifiers - and were close to booking their place in the World Cup finals. England played out a 0-0 draw with Colombia in a friendly international at Wembley. Easily forgotten – well it would have been had it not been for the extrovert Colombian goalkeeper René Higuita introducing us to the scorpion kick. It’s easier to watch than describe…. The annual Non League Day has seen some bizarre and ingenious ideas to promote the non-league game and increase its attendances. On Non League Day in 2013 Anglian Combination side Bungay Town saw its attendance increase by nearly 70% when they paid their fans 5p to watch them play. A year later, on 6th September 2014, they made the headlines with another novel idea - they gave each supporter a punnet of mushrooms! It doubled their normal attendance although I doubt whether the idea will be taken up by many clubs in the Football League! This day in 1960 saw Peterborough United play their sixth match in the Football League, against Crystal Palace at Selhurst Park with a mahoosive 36,478 attending. Five days later the return League match at London Road was played in front of a 21,171 crowd. Nearly 60,000 watching a new Football League side play two Division 4 matches in a week - that will surely never happen again! (Posh won both matches). Ron Greenwood selected six players from European Champions Liverpool, plus Kevin Keegan who had recently left Anfield for Hamburg, for his first match as manager of England. But England lacked cohesion and imagination in a disappointing 0-0 draw in the friendly against Switzerland at Wembley. Liverpool's Ian Callaghan made this third appearance for England in that match - his previous match for England had been 11 years earlier in 1966! Scotland pulled back from 2-0 down to draw 2-2 with the mighty Faroe Islands in a Euro qualifier – always worth remembering if there are any Scots you talk to about football! The first matches in the Football League were played. The five matches played saw 23 goals scored and attracted around 25,000 spectators. 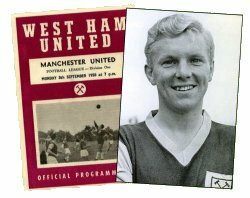 17-year-old Robert Frederick Chelsea Moore made his debut for West Ham United, a 3-2 First Division victory over Manchester United at Upton Park. Bobby Moore went on to make 544 League appearances for the Hammers before moving to Fulham in 1974 as well as playing 108 times for England. Tragedy at Bootham Crescent when York City's David Longhurst died when playing for York against Lincoln City in a Fourth Division fixture. The 25-year-old collapsed shortly before half-time and was pronounced dead when he arrived at the local hospital. He had only played 6 times in the League for York having previously made League appearances for Halifax, Northampton and Peterborough. In his memory a new stand at the Shipton Street end of York City's ground was named after him, the official opening of the David Longhurst Stand being marked with a friendly against Leeds United in October 1991. The day that Wayne Rooney became England's record goalscorer. His penalty in the 2-0 defeat of Switzerland in a Euro qualifier at Wembley was his 50th England goal, one more than Bobby Charlton...and the own-goals figure. But in the next days' papers his record hardly got any column inches compared with the main record breaker of that day - Her Maj had become the longest serving monarch in British history. When goals from John Hartson and Ian Wright (2) gave West Ham a 3-0 lead within the first half an hour against Wimbledon in a Premier League match at Upton Park the destination of the points looked a formality. But it became 3-1 at half time, 3-3 with 15 minutes remaining and then Efan Ekoku scored the winner for Wimbledon in the last few minutes. 4-3 to Wimbledon - who would have believed it? The first attempt to offer the British TV public regular live League football started – and finished – on 10th September 1960 when ITV broadcast the Saturday evening fixture between Blackpool and Bolton. 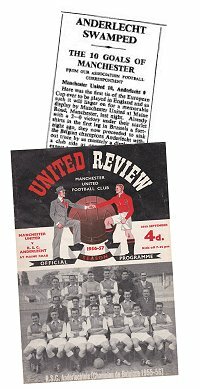 In 1953 those two clubs contested a famous Cup Final but by 1960 they were both struggling in the First Division and the fixture was missing its star player – Stanley Matthews – because of injury. It was a dismal match with poor TV ratings and the following Saturday (17th) Arsenal refused permission for their match against Newcastle to be televised as did Spurs the week after that (24th) for their match against Aston Villa. As a result ITV abandoned the project and nearly a quarter of a century passed before there was another live League match on British TV – Tottenham v Nottingham Forest on 2nd October 1983. Those far off days when the income of football clubs was based on fans paying at the turnstiles moved even further into history on September 10th 1998. On that day Manchester United brought to us MUTV - the world’s first TV channel dedicated to a single football club. Launched with the slogan ‘Get MUTV, get closer to Manchester United’ for a monthly £4.99 subscription it promised to bring everything Manchester United to the millions of armchair Reds fans throughout the world. Originally jointly owned by Manchester United, ITV and BSkyB as the channel established itself it became wholly owned by the club and another important income stream to be exploited. An impressive display by England who won 4-1 in Croatia in a World Cup qualifier. Theo Walcott became the youngest England player to score a hat-trick with Wayne Rooney scoring the other goal. The future was bright for England - surely? The first FA Cup trophy, known as the ‘little tin idol’ and which cost £20, was stolen from the shop window of a Birmingham boot and shoe manufacturer, William Shillcock. The cup had been lent by Cup holders Aston Villa who were later fined £25 by the FA to pay for a replacement trophy. The ‘little tin idol’ was never recovered. In a Scottish Cup First Round match Dundee Harp beat Aberdeen Rovers 35-0, surely a record that would last for ever. But amazingly 20 miles away on the same day in the same competition Arbroath beat Bon Accord 36-0 to record what is still the highest score in a senior football match in Britain. And surely it is a record that will last for ever? A sensation at Elland Road with Leeds United sacking manager Brian Clough after just 44 days in charge. Defending League champions Leeds had taken just 4 points from their first six League matches of the new season. Liverpool had a 9-0 home League victory over Crystal Palace with 8 different players scoring the goals. Despite that scoreline Liverpool scored more goals away from home than they did at Anfield in achieving their 18th League title that season. Liverpool did the League double over Palace that season but the Londoners did record a memorable cup victory over the Merseysiders in 1989/90 - beating Liverpool 4-3 in the FA Cup semi-final at Villa Park to reach their first FA Cup Final. The Faroe Islands had their moment of glory when they beat Austria 1-0 in their first competitive match, a Euro qualifier. The ‘home’ match was played in Sweden as the Faroes (population under 50,000) didn’t have a grass pitch to play on. The shirt worn by George Best when he scored six goals in Manchester United's 8-2 FA Cup victory at Northampton Town in February 1970 was sold at auction at Christie's for £24,000. At the same memorabilia auction two other shirts sold for more modest amounts. The top worn by Bobby Moore in his final Football League appearance (for Fulham v Blackburn in May 1977) and Eric Cantona’s shirt he wore in his last League match for Manchester United (v West Ham in May 1997) each sold for £3,600. One of those 'injuries' which the whole world soon found out about. Spanish international Marco Asensio missed Real Madrid's first Champions League match of 2017/18 because of a leg injury. He had shaved his legs - the razor was dirty - a hair follicle on his leg became infected causing a pimple - and so he couldn't pull one of his socks up. Must have been painful! The first double-figure scoreline in the Football League – the ‘Invincibles’ of Preston beat Stoke 10-0 on their way to retaining the League title. Kidderminster Harriers' Aggborough ground hosted the first ever FA Cup match to be played under floodlights. Non-leaguers Kidderminster and Brierley Hill Alliance met in a Preliminary Round replay, Kidderminster winning 4-2. Arsenal’s first European match of the 2017/18 season was always going to have an unusual feel about it. For Arsenal the previous 19 campaigns had seen them start the season in the Champions League but this time around they were in the more humble surroundings of the Europa League while Group opponents Cologne were playing their first European tie in 25 years. But what really made the tie unique was that over 20,000 Cologne fans made the trip to London – and the Cologne ticket allocation was only 2900. Large numbers of German fans bought tickets from touts causing security problems inside the Emirates as those tickets were in the Arsenal sections of the ground and many of their fans let off flares. But the major security problem concerned the thousands left outside the Emirates without tickets. There were fears that they would storm the turnstiles to gain entrance while the shear numbers of ticketless fans prevented those with tickets the chance to gain entry to the ground. A postponement was considered but the match went ahead after a one-hour delay, kicking off at 9.05. Arsenal won the match 3-1 and went on to progress to the knock-out stages – Cologne didn’t. UEFA later fined Cologne €60,000 (£53,000) for the crowd problems and ordered them to pay for the damage their fans had caused at the Emirates. Derby County were knocked out of the 1975/76 UEFA Cup by Real Madrid but in their next European tie - the First Round of the 1976/77 UEFA Cup - they were up against more modest opposition....Finn Harps from the Irish Republic. The Rams didn't manage a win in their first eight League matches of the 1976/77 season but against Harps on 15th September 1976 they made up for that. In front of a 13,353 Baseball Ground crowd Derby were 9-0 up at the break and eventually won 12-0 with goals from Kevin Hector (5), Charlie George (3), Leighton James (3) and Bruce Rioch. That was a new record score for Derby beating two 9-0 League victories recorded back in the 19th Century. Derby won the return leg 4-1 but were beaten 5-2 on aggregate by AEK Athens in the Second Round. The low point for Derby in the 1976/77 was that newspaper-style programme - should have been banned! Swansea City record their record victory, 12-0 against Sliema Wanders of Malta in the European Cup Winners Cup. Eight different Swansea players got on the scoresheet in the biggest victory by a Welsh club in a European competition. There only a few thousand TV sets in the country in those days but on this day in 1937 Highbury hosted the first live TV broadcast of a football match to test the technology of the time – Arsenal playing Arsenal Reserves in a match arranged for the cameras. It seems obvious but if you score a lot of goals you win prizes! Wolves found that out when they enjoyed their greatest period of success during the period when they became the only Football League side to score a century of League in each of four consecutive seasons. In a four season period starting in 1957/58 Wolves scored 422 League goals (103, 110, 106 and 103) - that's an average of 5 goals in every two matches. During that period they won the League championship twice and finished 2nd and 3rd in the other two seasons - and they won the FA Cup. Their best victory in those four seasons was 9-0 over Fulham at Molineux on 16th September 1959 - just a week after they had lost 1-3 at Craven Cottage in the first League meeting of the clubs that season! And the depth of that goalscoring talent was shown by the fact that six Wolves players scored that day - Norman Deeley (4) plus one apiece from Peter Broadbent, Eddie Clamp, Ron Flowers, Bobby Mason and Jimmy Murray. Jimmy Hill seemed to be football's been there, done that sort of guy. On Saturday September 16th 1972 at the Arsenal v Liverpool fixture the football personality stepped in, superman-like, to prevent the match being abandoned when he took over as a substitute linesman. The original linesman, Dennis Drewitt, suffered torn knee ligaments in the first half and was unable to continue. Those were the days before we had extra officials at each game and an announcement was made to the crowd appealing for a qualified referee to take over on the line. Up stepped Jimmy Hill who had been at the match as a spectator and the day was saved. 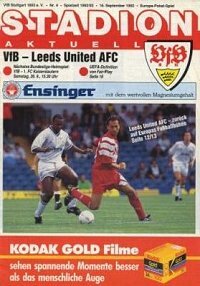 On this day in 1992 Leeds United became the first English club to play in the Champions League but in their first match were hammered 3-0 by Stuttgart in Germany. They went on to win the return leg 4-1 to go out on away goals but the Germans had broken the rules and Leeds were re-instated and won a play-off match. But in the next round they were beaten in both legs by Rangers. 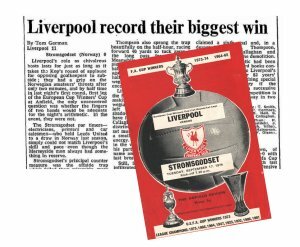 Liverpool beat Norwegians of Strømsgodset 11-0 in a European Cup Winners Cup First Round match – nine different Liverpool players scored in Liverpool's record victory. Derby beat Newcastle in the Premier League 1-0 at Pride Park in a record-breaking season for the Rams. It was Derby’s only League win of the season, they were guaranteed a relegation place in March and finished the season with just 11 points. Ouch! A first at Valley Parade at the League 1 match between Bradford City and Bristol Rovers. Referee Andy Haines took the players off the pitch for several minutes for health and safety reasons - a drone was flying over the playing area! It may have been the first time - but I've a feeling it won't be the last! When you think of European nights you think of big crowds, plenty of atmosphere, a special occasion. Not always so. When Dundee United visited Hafnarfjörður in Iceland for a UEFA Cup First Round tie on this day in 1990 the attendance was a mahoosive......263. Liverpool played their first match back in European competition following the tragic events at the Heysel Stadium in 1985. After a five year ban on English clubs in Europe and further one year on Liverpool alone the Merseysiders beat Finnish side Kuusysi Lahti 6-1 at Anfield in a UEFA Cup tie. The first match was played in one of the major stadiums in Europe, the San Siro in Milan. Originally solely the home of AC Milan they played a friendly against great rivals Inter Milan in the first match at the ground on 19th September 1926. Inter won with a very un-Italian scoreline – 6-3. In 1947 Inter moved in to share the ground with AC Milan while in March 1980 the stadium was officially renamed the Stadio Giuseppe Meazza in honour of a former player of both Milan clubs – although it is still generally known as the San Siro. It currently has a capacity of 80,000 and has hosted matches at the 1934 and 1990 World Cup finals as well as numerous European finals. 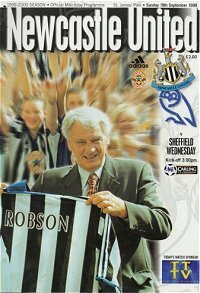 When Bobby Robson made his home debut as manager of Newcastle United things were bleak for the Magpies - only one point from their first seven Premier League matches of the season and no win at St James' Park since February. But Newcastle beat Sheffield Wednesday 8-0 with Alan Shearer scoring 5 of them - a perfect start or what! The world of football was shocked by the news that the ‘Special One’ was leaving Chelsea. Increasing tensions between club owner Roman Abramovich and manager José Mourinho came to a head after an unimpressive start to the new season, Mourinho ending his first stint at Stamford Bridge ‘by mutual consent’. He was back at the club in 2013. The biggest news in world sport that day came from the Community Stadium in Brighton although the storyline wasn't generated by the football club who played there. 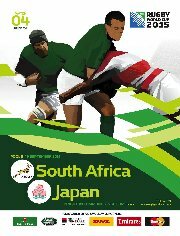 Brighton & Hove's home ground was used for a couple of matches in the 2015 Rugby Union World Cup finals and in the first of those Japan played South Africa. In a result that was widely described as the biggest shock in the history of the game the minnows of Japan beat the mighty Springboks 34-32. Amazingly though the Japanese were to create another bit of World Cup history - they became the first side ever to win 3 of their 4 group matches but fail to progress to the knockout stages of the competition. Well, if you had never come across ghost goals, phantom goals or the need for goal-line video technology you certainly would have done after the League match between Watford and Reading on 20th September 2008. In the 13th minute of the Championship fixture Watford defender John Eustace put the ball out of play for a corner when being challenged by Reading striker Noel Hunt. But despite the ball having gone out of play yards outside the goalpost and to the astonishment of everyone in the 14,761 Vicarage Road crowd linesman Nigel Bannister flagged it as a goal. Watford protested – their manager Aidy Boothroyd was sent to the stands for protesting too much - but rookie 25-year-old referee Stuart Attwell upheld the decision and a goal for Reading it was. The match ended 2-2 with that ‘goal’ going down as a John Eustace own goal. After the match there was much talk of whether Reading should have allowed Watford an unopposed equaliser. There were also suggestions that the match should have been replayed. But the rule is that the refs decision is final and so a goal it was and a goal it stayed! When fans of Turkish side Fenerbahçe invaded the pitch in a pre-season friendly against Ukraine's Shaktar Donetsk the Istanbul club expected to be playing behind closed doors for a while as a punishment. Instead the Turkish FA ordered that a match be played with no males over the age of 12 being allowed entry. So on 20th September 2011 a crowd of 41,000 women and children were present for Fenerbahçe's League match with Manisaspor. Players from both clubs flew flowers to the fans before the match - you just can't see that happening at Millwall could you - and no crowds problems followed in the 1-1 draw. England were beaten for the first time on home soil by a foreign country. The Republic of Ireland won 2-0 at Everton's Goodison Park. Pat Jennings became the first Irishman to win 100 international caps when helping Northern Ireland to a 3-1 victory over Austria in a Euro qualifier in Belfast. Charlton Athletic beat Stoke 2-0 in front of an 8,858 crowd who witnessed the clubs' last match before a period of exile from their home ground, The Valley. Money problems, sadly. There were ground-shares with Crystal Palace and West Ham before Charlton finally returned home in 1992. Leeds United were once one of the top sides in Europe....honestly! When the UEFA Cup replaced the Fairs Cup at the start of the 1971/72 season UEFA invited the two clubs with the best records in the Fairs Cup to play-off for the honour of keeping the old trophy. One was Barcelona, who won the first Fairs Cup final in 1958, with the other being Leeds who had defeated Juventus to win the last Fairs Cup final in 1971. 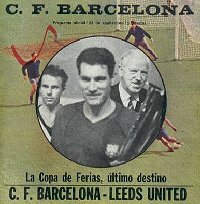 On 22nd September 1971 in front of 35,000 at the Nou Camp Leeds were beaten 2-1 by Barcelona. But hey, Leeds were good enough to be there! In a first Division fixture at Loftus Road visiting Newcastle United were 4-0 up against QPR at half-time. It was 5-5 at the final whistle! Jonathan Woodgate didn’t make the best of debuts for Real Madrid following his move from Newcastle – he scored an own goal and was sent off against Athletic Bilbao. Third tier side Wycombe Wanderers got their name into the record books by reaching the FA Cup semi-final in 2000/01 but earlier in the same season they had made the headlines for another reason. Against Peterborough United at Adams Park in a Division 2 match on September 23rd 2000 Wycombe's Jamie Bates scored with the last kick of the first half. A Wycombe kick-off started the second period and seconds later, before a Peterborough player had touched the ball, Jermaine McSporran hit the Chairboys second goal. Two goals in just nine seconds of playing time without an opposition player touching the ball - unique or what! When Arsenal beat Sheffield United 3-0 in a Premier League match on this day in 2006 all three goalscorers shared the same birthday – 17th August. Arsenal’s William Gallas and Thierry Henry (both born in 1977) plus Sheffield United’s Phil Jagielka (an own goal, born 1982) scored the goals. I'm still not sure whether this was a genuine worry or just a great publicity exercise but when ITV were due to screen a live one hour episode of Coronation Street to mark the 60th birthday of ITV they panicked when they realised that on the same night Manchester United were at home to Ipswich Town in a Carling Cup tie. With the Coronation Street studios being less than a mile away from Old Trafford they feared that crowd noise would disrupt the live broadcast. As it was, although Wayne Rooney scored for the soap opera that is Manchester United while the programme was being broadcast not a sound was heard on the soap opera that is Coronation Street. United went on to win 3-0. Arsenal paid Crystal Palace £2.5m for forward Ian Wright with many doubting the wisdom of paying a then club record fee for a player not far off his 28th birthday. But Wrighty scored a hat-trick on his Arsenal League debut and went on to score 185 goals in 288 first team appearances, a Gunners record until Thierry Henry came along. Just 2,081 turn up for the Wimbledon v Peterborough League Cup tie at Selhurst Park, the lowest ever home attendance for a top-division club in the competition. Posh won 2-1. 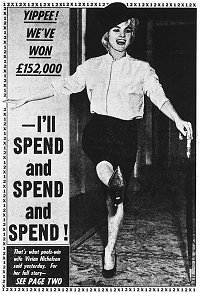 Most will remember Tom Finney as a loyal one-club player but on September 25th 1963 he made his only competitive appearance for a club other than Preston - in the European Cup. Three years after playing his last Preston game George Armstrong, the manager of Northern Ireland champions Distillery, coaxed the 41-year-old Finney out of retirement to play for Distillery in their European Cup-tie against the Portuguese giants Benfica. 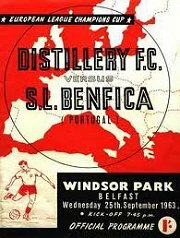 On this day in 1963 a 19,326 Belfast crowd witnessed a memorable 3-3 draw between the sides but without Finney in the return leg Benfica ran out 5-0 winners. The first European Cup match was played on English soil. Manchester United entertained the Belgians of Anderlecht at Maine Road….and won 10-0 (12-0 on aggregate). This was going to be easy! The first two matches in the League Cup were played – Bristol Rovers v Fulham and West Ham v Charlton – Fulham’s Maurice Cook scoring the first goal in the competition. The headlines were from Hillsborough where Sheffield Wednesday defeated Arsenal 1-0 in the Premier League. Wednesday's Paolo Di Canio was sent off and he then pushed ref Paul Alcock who fell to the ground in a very dramatic manner. Di Cano was later charged with misconduct - he was banned for 11 matches and fined £10,000. Following their much-criticized move from South London Wimbledon played their first ‘home’ League match at the National Hockey Stadium in Milton Keynes, drawing 2-2 with Burnley. 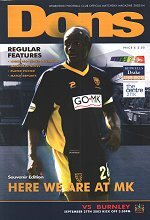 They didn’t change their name to MK Dons until the start of the 2004/05 season. 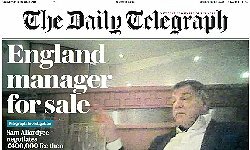 We woke up to find England manager Sam Allardyce making front page headlines in the Daily Telegraph. In a newspaper 'sting' he had been filmed advising undercover reporters how to get around FA rules on third-party ownership of footballers, criticising his predecessor Roy Hodgson and the England players and arranging a £400,000 a year speaking engagement contract. By the end of the day by 'mutual consent' he was the ex-England manager losing his £3 million a year job after just 67 days. Mind you, with an England record of played one and won one that made him statistically the best England manager of all time! An early kick off in a First Preliminary Round FA Cup between Burton Swifts, in Division 2 of the Football League, and non-leaguers Singers of Coventry – 8 o’clock in the morning! 18-year-old Wayne Rooney made a spectacular debut for Manchester United hitting a hat-trick in United’s 6-2 Champions League victory over Fenerbahçe at Old Trafford. It was the first hat-trick Rooney had scored in his professional career. 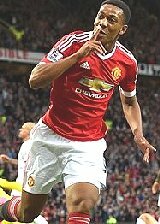 It proved the perfect start to an amazingly successful career at Old Trafford. By the time he returned to Everton in July 2017 he had broken Bobby Charlton's club goalscoring record with 253 goals in 559 first team competitive appearances and had picked up winners medals in the Premier League, FA Cup, League Cup, Champions League, Europa League, FIFA World Club Cup as well as the Community Shield. Not bad! Chelsea record the highest score by an English club in a European competition. 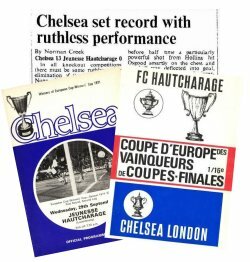 They beat Jeunesse Hautcharage 13-0 in the European Cup Winners Cup to complete a 21-0 aggregate victory. Peter Osgood scored five on the night. Two clubs have scored 9 goals in a Premier Division match – Manchester United (9-0 v Ipswich in 1995) and Spurs (9-1 v Wigan in 2009) – but on this day in 2007 a new record was set for the most goals in a Premier League fixture when eleven goals were scored at Portsmouth in their match against Reading. The 20,102 Fratton Park crowd certainly got value for money that day - Portsmouth were 2-1 up at half time but at the final whistle it was Portsmouth 7 Reading 4. There were nine different goalscorers in the match with Portsmouth’s Benjani Mwaruwari scoring three of them, another two were own-goals and one was a penalty – with another penalty being saved. Amazing! There was a more innocent time when the most popular gamble in the country was the Football Pools and the winners often became media personalities. Most famous of those was Viv Nicholson who on September 30th 1961 with her husband won £152319 18s 8d for a five bob (25p) bet. That was a win of over £3.5m in todays money. But she couldn't escape the media attention and within 5 years her husband had been been killed in a car crash and she was nearly skint. Years later both a book and a West End musical about her life had the same title - Spend, Spend, Spend. Manchester City bad-boy Joey Barton was in the headlines again when he bared his backside to Everton fans after a 1-1 Premier League draw at Goodison. He later received a warning and a £2000 fine.